This hotel is located less than 4 miles (6 km) from the Fort Lauderdale/Hollywood International Airport. The hotel offers airport transfers. The Bridge at Cordova Boutique Hotel features scuba diving lessons. All guest rooms features cable TV. This Panama City Beach hotel is next to the Gulf of Mexico, across the street from Gulf World Marine Park. The hotel offers an oceanfront pool and free airport shuttle service. This Orlando, Florida hotel is located inside the Crowne Plaza and is off Interstate 4. The hotel features a business center and kitchenette in every room. Guests at the City Place Extended Stay and Hotel can dine at District Five Restaurant. 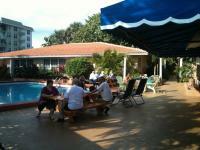 This Courtyard hotel is just 10 minutes' walk from the Manatee Players Riverfront Theatre. 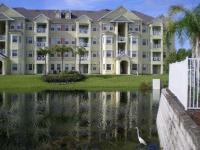 It offers an outdoor pool overlooking the Manatee River, and the modern Bistro Restaurant and Lounge. This Miami Springs, Florida hotel offers free shuttle services to the Miami International Airport and Port of Miami. The hotel includes an outdoor pool and rooms provide free Wi-Fi. Located along Highway 192 in a gated community of Kissimmee, Florida, the Cane Island Resort is minutes away from Walt Disney World and downtown Disney. Within walking distance of vibrant Ocean Drive and beautiful beaches, this Art Deco-style hotel features exceptional amenities and services, including free airport pick-up service and VIP access to area nightclubs. This Key West bed and breakfast is a short walk to Ernest Hemingway's House and the beach. This inn features an outdoor pool, continental breakfast and free Wi-Fi.